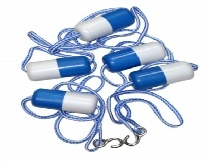 This roping is made especially for use in the harsh environment of the swimming pool. Color-safe, strong, floating polypropylene swimming pool rope allows minimal stretch, resists color fading and deterioration. Available sizes: 1/4”, 3/8”, 1/2”, or 3/4”. Rope floats are commonly used to separate the shallow and deep ends of a pool, safety lines and swimming lane lines. Constructed of a strong woven poly fiber. Metal hooks on each end of rope for a locking device. 2-1/2″ x 5″ polyethylene pool floats. Available sizes: 16’, 18’ and 20’ lengths.